The time has come for Alena to take her rightful place as queen, but her troubles are far from over. Having saved Britain from invaders, Alena is now accepted by her people. Her choice for king, however, is met with dismay. Both her advisors and the nobles believe they know better whom she should wed. In the midst of the turmoil after her coronation, Alena is betrayed by those she holds most dear. 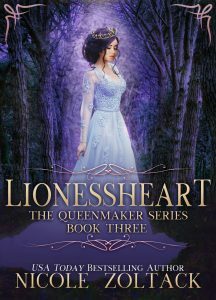 Uncertain who to trust, Alena must rise up as the Lionessheart to save the day once more when another threatens to destroy everything she has achieved.